Trout fishing in the summertime in Pennsylvania is limited. There are not a lot of places that hold trout year round. I can only think of a few in the region where a trout angler can experience a quality trout fishery this time of year. To experience this I hopped in the car with a few buddies and headed to Central PA’s Spring Creek to fish yesterday with Zettle Outdoors and had a banner day. We had several factors work with us yesterday. The cooler nights combined with a recent cold front, and a small amount of precipitation kept the bite persistent throughout the day. Some rain, but not too much, fell on Saturday and helped cool things down enough to enable an all day bite. The water was in the low sixties and trout are starting to feed more now that things have cooled down. A half dozen of us focused on about a mile section of Spring Creek, where bait is allowed, but all fish must be released. Throughout the few hours we fished we caught rainbows, golden rainbows and browns. There’s a wide variety of trout in the system. Our catches ranged from six to 25 inches. Trout were scattered throughout the system. However, most were holding in the deeper sections. The fast runs and deeper pools maintained the most trout. We didn’t see any trout in the shallows. All of them were in water three feet, and deeper, and close to structure. There weren’t any fish in the open. They were hugging rocks, trees and other structure. The water is still crystal clear, which forced us to use four-pound Berkley Vanish with a four-pound fluorocarbon leader. We used size 18 Daiichi egg hooks and size 12 Gamakatsku octopus hooks. All of our trout were caught on Pautzke Fire Bait and single salmon eggs. We threw a lot of Natural Deluxe and as the bite changed we switched to Pink Shrimp and Silver Label. When we drifted eggs all were done so under a Trout Magnet Float. When it came to Fire Bait the Feed Pellet Brown (which was our hot bait in the winter) proved best, but we also caught them on Natural and Peach Garlic. With temperatures likely continuing to fall I’m expecting the bite here and at many other Central PA streams to only improve. In fact, Youghiogheny River in Southwest PA and Erie streams and rivers are starting to see fishing improve. Our typical fall patterns are about to set in, which means I and many other trout anglers will be back out frequently. Editor’s Note: Anglers must release all trout at Spring Creek. Please check regulations to ensure you are fishing a section of the creek that is open to bait and is on public land. 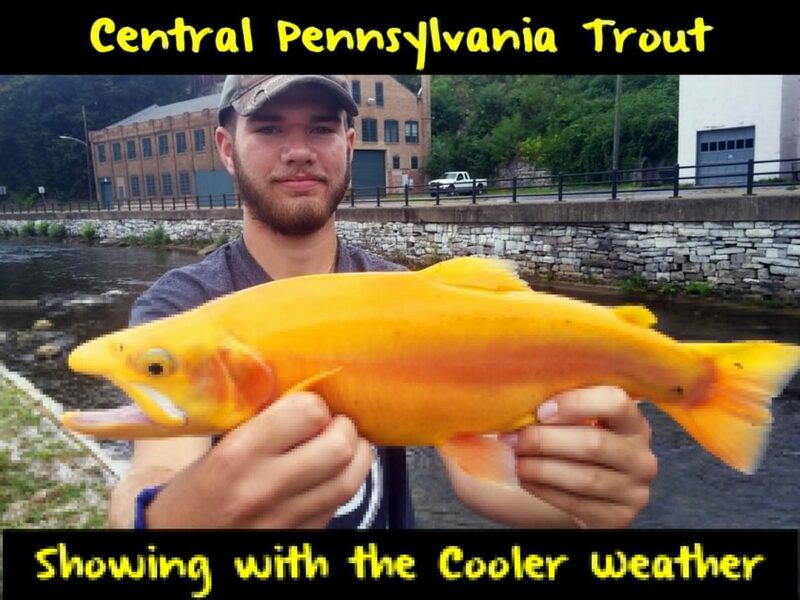 For more information and regulations please visit the Pennsylvania Fish & Boat Commission at http://fishandboat.com/trout.htm. For more info on Zettle Outdoors please visit https://www.facebook.com/isaaczettle28.